How a rapidly growing telecom’s managers are now able to see customer patterns, monitor physical networks, calculate profits and plan fiber optic upgrades – all on a single clickable landscape. 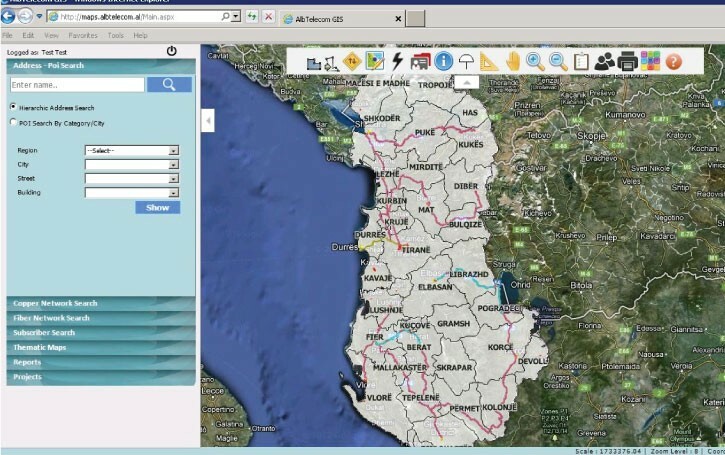 Mapbis integrated the diverse data into a single, easy-to-use geographic information system (GIS). This way, ALBtelecom became able to analyze customer patterns, calculate revenues and costs, and plan the best way to install new fiber optic lines – all geographically, and zoomable to any scale, from a single home address to the entire country and beyond. More importantly, ALBtelecom’s staff are now able to synthesize all available knowledge as they decide where their company will go next. What exactly did Mapbis provide? ALBtelecom, using Mapbis’ integrated GIS environment, is now ready to improve field sales and maintenance through real-time network data accessed with mobile tablets. ALBtelecom is also ready to project returns on investments by location, capacity, and usage rates, as it makes the transition from a mostly copper to a fiber optic network. All applications developed for ALBtelecom can easily be scaled up for larger company operations (please see the Türk Telekom Group case study).